Like a lot of you we’ve spent most of the weekend thinking about one thing: Inception. 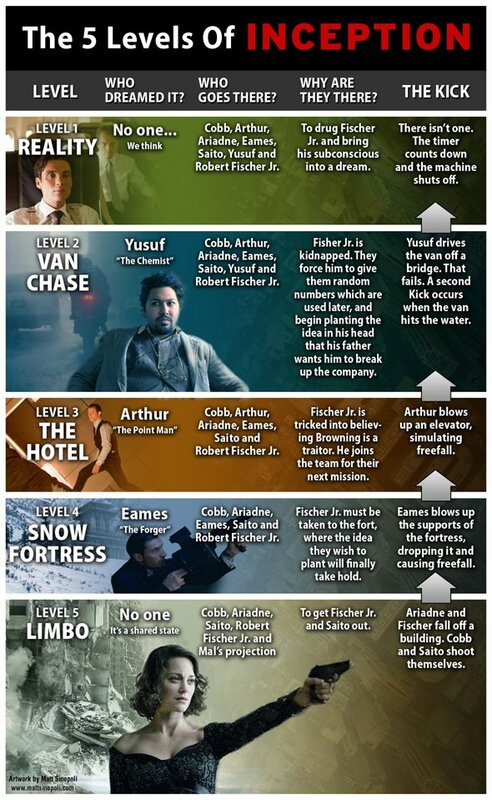 You can see our attempt to explain what’s going on the movie here but before you can even begin to guess at director Christopher Nolan’s intentions or what happens after the movie’s mind-blowing final sequence, you’ll need a clear idea of all the levels of Inception. SPOILER WARNING: What follows should only be viewed by people who have already seen Inception. It contains heavy, critical spoilers which will impact your viewing of the film. If you haven’t seen Inception yet, stop reading and don’t come back until you do.